Here is a set I made using the Archivers/Hero Arts stamp and die set with lots 'o glitter, as a matter of fact my dog Duffy is still wearing the glitter! I am submitting these under "A few of my favourite things". The stamping on glitter technique is one of my favourites for the holidays. To make the ornaments I used double sided tape sheets. 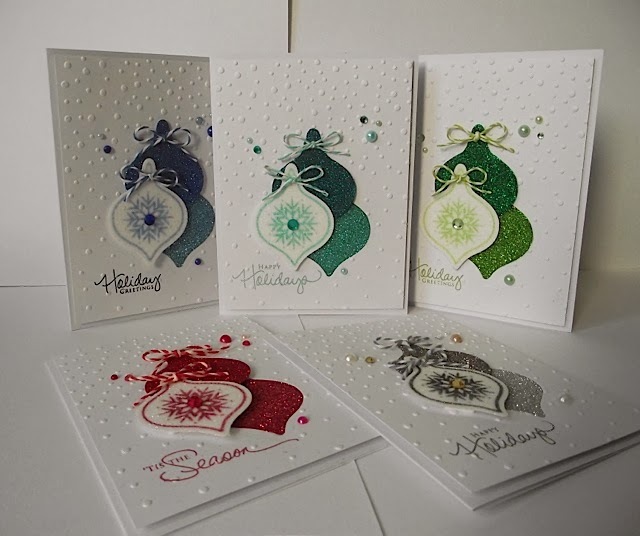 Glued one side to thin plain white card stock, die cut the ornaments then removed the tape covering from the top part and glittered the surface. Sprayed with glue to hold the glitter in-place. This is from a tutorial I saw on Barb Engler's blog last year (see link here). I love the way these turned out--beautiful cards!